"I’m going to honor my oath of office," Sen. Mitt Romney, R-Utah, said. 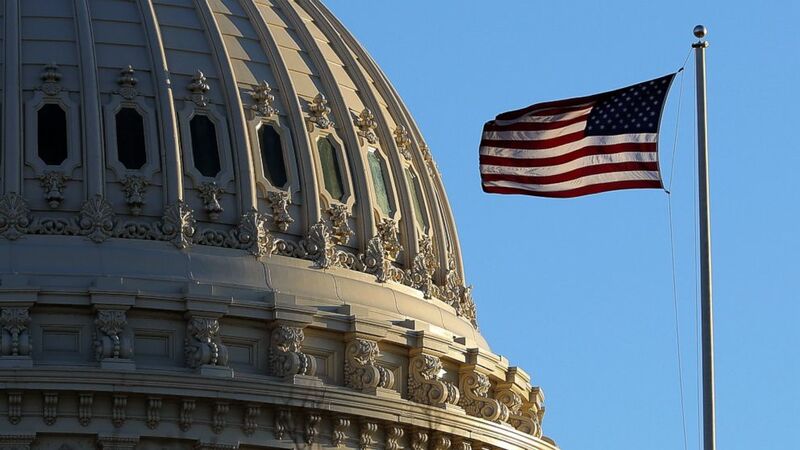 In a stinging rebuke to President Donald Trump, 12 Republicans joined Democrats as the Senate voted to reject his decision to declare a national emergency in order to build a border wall -- a striking blow to his agenda and a clear warning to Trump about presidential overreach. The final vote was 59-41. 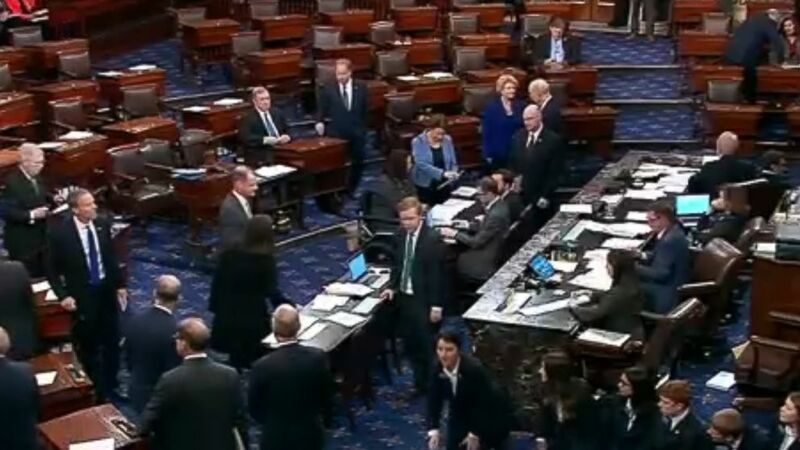 (C-SPAN) An image made from video shows politicians and staff on the floor of the U.S. Senate and the vote tally for terminating President Donald Trump's border emergency declaration, in Washington, March 14, 2019. All told, twelve Republicans voted with all 47 Democrats in support of the resolution to terminate his emergency declaration. Trump has now been forced into the embarrassing position of having to likely issue his first veto -- of a measure that garnered so much GOP backing. The House voted to terminate the declaration last month. Just after the vote, Trump made his intentions clear with a one-word tweet: "VETO!" He then followed up with a second tweet thanking all the "strong Republicans who voted to support Border Security." After the Senate vote, House Speaker Nancy Pelosi formally signed the resolution that would be sent to the president's desk. 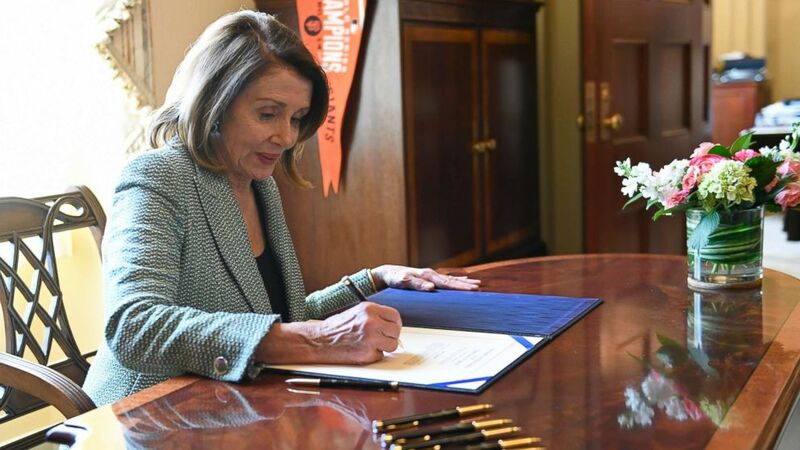 (Susan Walsh/AP) House Speaker Nancy Pelosi of Calif., signs H.J. Res 46, a disapproval resolution that blocks President Trump's national emergency declaration, on Capitol Hill in Washington, March 14, 2019. Earlier on Thursday, Trump repeated his earlier threat to veto the resolution. "I don't know what the vote will be. I'll probably have to veto. It won't be overturned and the legal scholars say it's totally constitutional," Trump said. "It is very important. It is a border security vote. It is pure and simple, a vote for border security." "If I do a veto, it's not going to be overturned," Trump added later. (CQ Roll Call via Getty Images, FILE) Sen. Mitt Romney talks with reporters before the Senate Policy luncheons in the Capitol, March 5, 2019. Just ahead of the afternoon vote, Republicans one by one started making their positions clear. "This is a constitutional issue and I’m going to honor my oath of office," Sen. Mitt Romney, R-Utah, told reporters Thursday. He announced earlier in the day he would oppose the president. Romney said he informed Trump about his decision last week. 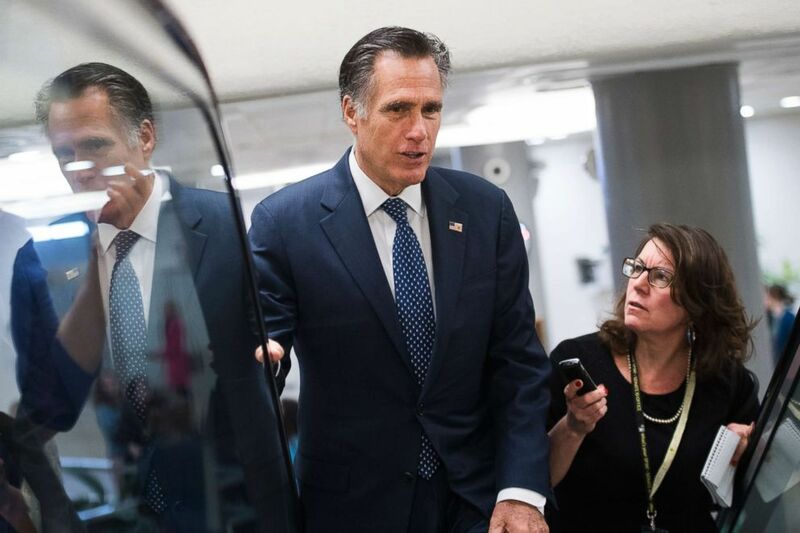 "He'd rather have me vote in a different direction but I let him know that this for me is a matter of defending the constitution and the balance of powers that is core to our constitution and I believe he respects that," Romney said. Earlier in the day, Senate Majority Leader Mitch McConnell announced he would stand by Trump. "Let me first say that I support the president’s decision. So I will vote today to uphold it and reject this resolution of disapproval," McConnell said on the Senate floor. Senate Republicans -- in hoping to avoid another stinging embarrassing the president -- were earlier in the week seeking to limit the number of defectors within their caucus who would buck Trump on the resolution. At least a dozen Republicans signaled in recent weeks they were unhappy with the president's decision to go the route of a national emergency. Many Republicans have expressed their concerns about the president’s ability, under the declaration, to move funds that have already been appropriated by Congress. They've also said they are concerned about the precedent it could send should a Democrat become president. (Chip Somodevilla/Getty Images, FILE) The last rays of sunlight fall on the dome of the U.S. Capitol, Jan. 30, 2018 in Washington. Vice President Mike Pence was on Capitol Hill Tuesday afternoon meeting with Republicans on a potential deal on a separate piece of legislation that would alter the National Emergencies Act, in an effort to assuage senators who have issues with Trump's emergency authority. One of the proposals under consideration was from Sen. Mike Lee, R-Utah, and is designed to give Congress some authority over the emergency powers granted to the president. His proposal would amend the National Emergencies Act of 1976 to say an emergency declaration would automatically expire after 30 days unless both chambers of Congress vote to approve it. The legislation was seen as providing an off-ramp to a number of Republicans who were concerned about the president’s move to declare a national emergency but did not want to be seen as opposing him. "It becomes a resolution of approval, not disapproval," Lee told reporters Tuesday. But on Wednesday during a caucus lunch, Lee received a phone call from Trump where he was informed Trump was not on board with his legislation that would rein in his presidential powers. Trump, attempting to limit the number of defections, later tweeted a compromise on Thursday. "Prominent legal scholars agree that our actions to address the National Emergency at the Southern Border and to protect the American people are both CONSTITUTIONAL and EXPRESSLY authorized by Congress…If, at a later date, Congress wants to update the law, I will support those efforts, but today’s issue is BORDER SECURITY and Crime!!! Don’t vote with Pelosi!"